Namesake - The building was named after J. Whit Potter (1851-1923). He was born in Warren County and was a regent of Western KY State Normal School. He was also the President of the American National Bank and Potter-Matlock Trust Company. 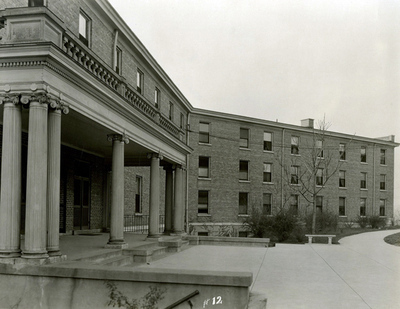 History - When the 3-story building was built in 1921 it was originally a women's dorm that housed 175. Dedicated on June 21, 1921, the cost to live there was $8.50 a month. It also had a 300 seat cafeteria for the girls to dine at. From 1942 until the end of 1943, air cadets occupied the building. In 1949, the dorm was converted for a women's dorm into a men's dorm. In 1957 Potter Hall went back to a girl's dorm because of two new men's dorms that were built. In 1994 (approximately), the building was renovated into an office building. Offices included admissions, financial aid, counseling services, career services, and the registrar.